Typically, you just need your swim outfit (snug fit is best), goggles and a swim cap (if you prefer to wear one). 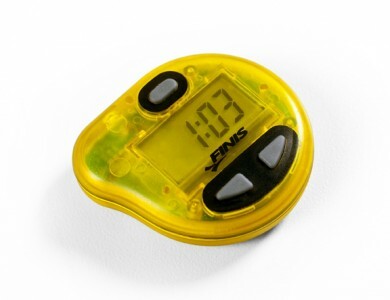 You will eventually need to acquire a Finis Tempo Trainer (now about $40 USD online). It is one of the best pieces of training equipment you can have in your bag. The assignments in most of our training courses will have you use a Tempo Trainer or give you the option of using one to enhance the training effect further. It is useful for tuning your timing and precision of movement to a higher degree. You may find one for sale on the Finis.com site, on Swimoutlet.com, and on Wiggle.co.uk. Look for one on sale. Such as these Positive Drive fins made by Finis. 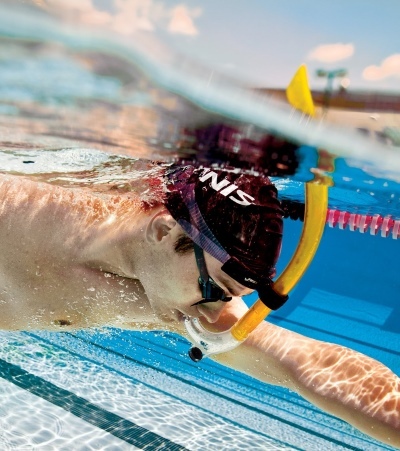 Such as this Swimmer Snorkel made by Finis. Besides these two we are not often going to recommend other artificial assistance devices because the whole point of our training is to build your skills to replace dependence on those devices.